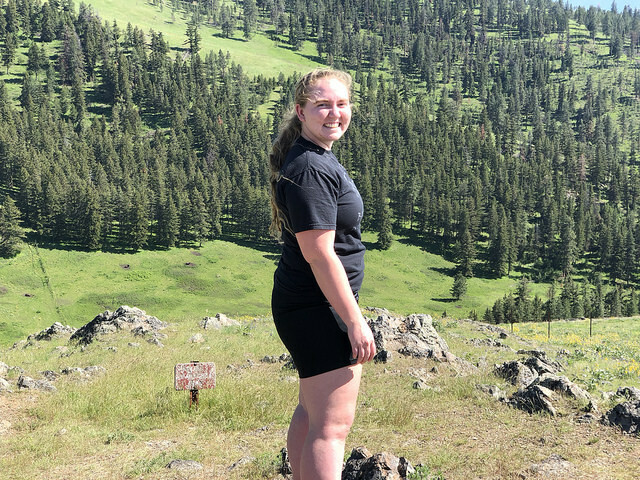 Congratulations to the Powers Lab’s own Natalie Amodei who was awarded a Sigma Xi Grant-in-Aid-of-Research for her proposal entitled “Can hummingbirds upregulate evaporative heat dissipation during hovering to compensate for loss of passive heat transfer at high temperatures?” Natalie will use the grant to help fund her research in Arizona this summer. 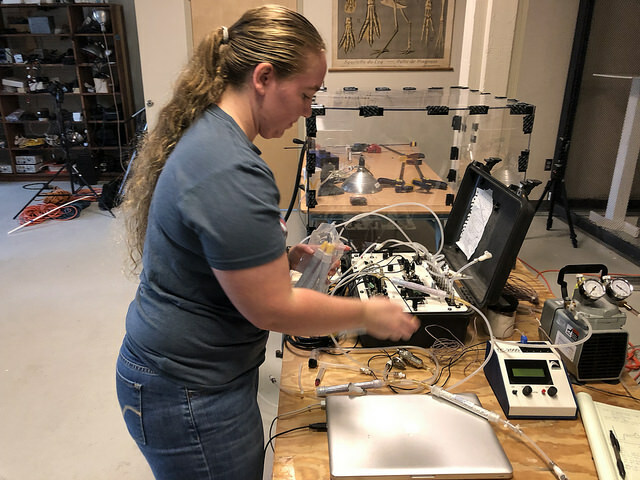 Natalie assembling an open-flow respirometry system. The Powers Lab began 2018 with their annual trip to the Society for Integrative and Comparative Biology (SICB) meeting in San Francisco, CA (January 3-7). Traveling to the meeting to present their research data were Don Powers along with undergraduate researchers Isabelle Hoyven Cisnaros and Kaheela Reid. Don presented the lab’s continuing work on heat dissipation by hovering hummingbirds at high environmental temperature. Both students also presented with Isabelle presenting her work on nighttime body temperature management by hummingbirds and Kaheela presenting her work on how hummingbirds might dissipate heat from their bills. Lab collaborators Bret Tobalske (University of Montana), Anusha Shankar (Stony Brook University) and Jeff Yap (Simon Fraser University) were also at the meeting and made presentations. Anusha presented some additional data on hummingbird nighttime body temperature management and Jeff presented our collaborative work in reproductive energetics in zebra finches. In all the lab was involved in five presentations make for a successful meeting! Collaborator Anusha Shankar starting her talk at SICB. Don beginning his talk at SICB. Isabelle and collaborator Anusha Shankar enjoying a night out at SICB! Always enjoy seeing our friends at Sable Systems at SICB!! Isabelle presenting her poster on hummingbird management of nighttime body temperature. A nice French dinner in San Francisco with collaborator and friend Bret Tobalske! Kaheela presenting her poster on heat dissipation from hummingbird bills at SICB. Kaheela and Isabelle waiting for the plenary to start at SICB. Field Work at the Southwestern Research Station!! ≈ Comments Off on Field Work at the Southwestern Research Station!! The Powers Lab just wrapped up the 2017 field season at the Southwestern Research Station (SWRS) in the Chiricahua Mountains, SE Arizona. We were joined this year by Anusha Shankar, who along with research student Isabelle Cisneros, tackled the difficult task of tracking overnight changes in hummingbird body temperature. Our primary goal in this study was to see if hummingbirds use regulated shallow torpor (hypothermia) as an alternative to deep torpor at night. The protocol called for the birds to be outside (natural light and temperature cycles) in an open container that would allow them to just leave when they woke up in the morning. Ultimately we got some great data, but both Anusha and Isabelle the days continually modifying the chambers reducing the large plexiglas box that was originally designed to a small cubical that would place the bird in good filming position. In the end we got some great data, including one bird that appears to have used regulated shallow torpor! 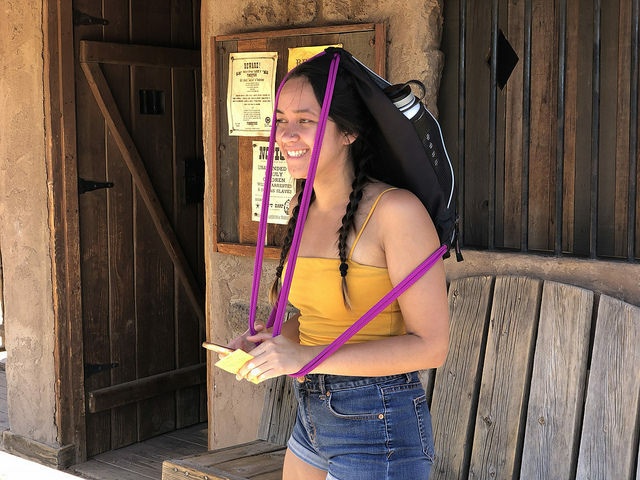 Research student Kaheela Reid was also with us in Arizona to do experiments measuring the influence of evaporative heat dissipation on resting metabolic rate in hummingbirds. We ended up have significant system design issues that prevented us from getting any good data, but we will work on this back in the lab and perhaps try again next year. We are not back in the lab crunching number and preparing for the many we will be doing in the coming months! Don going over things with Kaheela (photo by Antonella Wilby). Don giving a seminar at SWRS. Isabelle and Anusha getting ready to collect data! Isabelle and Anusha working on data. Enjoying some fine dinning on a trip to town. Final iteration of the torpor chamber. Kaheela feeding a blue-throated hummingbird (photo by Antonella Wilby). Anusha showing Kaheela how to hold a hummingbird. Anusha demonstrating use of the traps to Isabelle. Early iterations of the torpor chambers. Kaheela working on the open-flow metabolism system. Isabelle and Anusha making the lab dark for torpor measurements. Kaheela adjusting the IR camera. Anusha working on the torpor chambers. Isabelle and Kaheela setting up our feeders at SWRS.